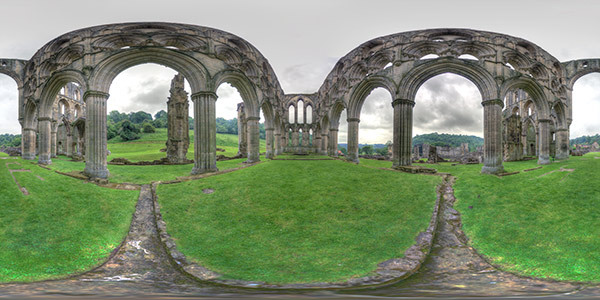 Immersive view from the presbytery of Rievaulx Abbey. This panorama was produced using a tripod, a levelling platform and a pano head. The 14 images that contribute to it are composed of 3 bracketed shots at 0, +3 and -3EV. The images were then stitched using Hugin and then transformed into a multi-resolution panorama with KRPano. The original stitched image dimensions are 10768×5384 and the version here was made from an image downsampled to 6000×3000 pixels.